In the academic year 2003-2004 the Yeshiva consolidated all the dormitories in four adjoining apartments and built a new Beis Hamidrash opposite the dormitories. The area between the Beis Hamidrash and the dormitories was renovated to provide a full size basketball court. 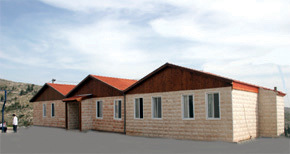 In the academic year 2004-2005 Lev Aryeh constructed a new dining room, kitchen, a new library and shiur rooms adjoining the Beis Hamidrash. Lev Aryeh now has a Beis Medrash that comfortably seats one hundred Talmidim a dining room of the same size three shuir rooms and a large library of Hebrew and English Judaica, which presently has close to 3000 volumes. The next stage of the Yeshivas development is the construction of a new dormitory.